'Twas another tranquil day in Tolle. Suddenly, a rebel miner appeared! Kun'Asuka objected to the way Agent M0N0 was enforcing the Code. Specifically, he didn't like the bumping part. Kun'Asuka questioned whether the New Order was even contributing to the community. Kun'Asuka continued to spew profanity in local. But after a few minutes, he unceremoniously disappeared. M0N0 had petitioned him! Ice miner and serial malcontent Myles O'Bryen, of all people, agreed that Kun'Asuka's behavior was inappropriate. Time will tell how long the ban will last, though M0N0 estimates that it will probably be a 30-day ban, since that's how long an individual was banned after making a suicide joke at Fanfest. Kun'Asuka, if you're reading this, I hope you see this ban not as a punishment, but as an opportunity to reconsider your choices. 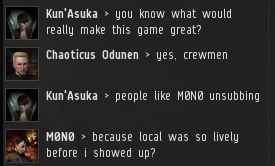 If and when you return to the game, please pay 30 million isk and join the New Order. We're a very forgiving bunch, and we would love to have you become a miner-bumper as part of your rehabilitation. I think we've all learned something important today. 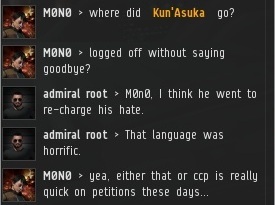 CCP and its GM staff continue to play a valuable role in promptly punishing those who violate the EULA. While the Agents of the New Order will never be banned for bumping non-compliant miners, the miners need to remember to behave themselves. The safest option, of course, is for a miner to comply with all the terms of both the EULA and the Code. If he get a 30 days ban fine, but i hope for him he will learn in 30 days how to behave like a human beeing not like a soulless bot. Nice timeout for the unfortunate to enjoy the outside and be truly away from the keyboard, as the person her/hisself suggests in the first place. So the miners have filed hundreds of petitions against us to no success, then the New Order's first petition results in a ban. If failed petitions count as a win for the New Order, then I'm sure that number is somewhere around 200-0 us. Wow, what a great day for freedom. If he was banned, it was short-term... he was back in Tolle today, talking a big game, piping up every so often to remind everyone that he was not, in fact, banned. 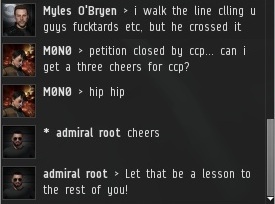 I wonder, how would CCP go about "nerfing" bumping? Would they remove collision detection? Make stationary ships unmovable? Some sort of space anchor? If they do so, what next? 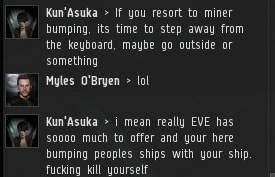 Maybe a ISD to hold your hand while you do trading so that you won't be scammed in Jita and ban those who are meanies in local chat? Perhaps they give your parents free accounts so that they can lend a shoulder to cry on if things go wrong? I was told this was a adult playing enviorment, but as usual, the cake was a lie. What if they made you set your ship to ramming speed? It would flag you as an aggressor so that a bumper and miner could engage in combat without Corcord intervening. I know it won't work but...the Star Trek reference was worth it! That does not deserve a ban! He was referring to suicide ingame(like suicide ganking himself on a miner?). I saw no mention of it referring to real-life suicide.